Like everyone else in America, I woke up to the news that Anthony Weiner is at it again. After his latest round of sexual indiscretions, his wife Huma Abedin has announced she’d separating from him. 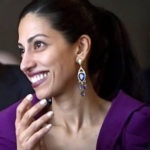 Huma of course is Hillary Clinton’s top aide, and likely White House Chief of Staff if she wins the Presidency. This news comes barely two months before the election, and the opponent has a tendency to invoke these things. So naturally, my mind went in search of the politically salient points of the story. Then I realized I just don’t care. I don’t know Huma Abedin. Never met her. I happen to be Facebook friends with her sister, but I really don’t know her either, which shows you just how little the ‘six degrees of social media’ game means. But from everything I’ve heard from people who would know, Huma Abedin is brilliant and kind hearted and even handed. Even as she looks to help get Hillary Clinton elected President, she’s quietly blazing a trail of her own, as no woman has ever been White House Chief of Staff. She’s also pulling double duty as a pioneer, because she’s a Muslim. In other words, they’re going to be making movies about Huma Abedin someday, about the parallel trail she was quietly blazing even as her boss was making history. And yet because she’s a woman, or because she’s a Muslim, or just because she’s there, the Republicans and Donald Trump have repeatedly attempted to scandalize her. They tried and failed to drag her down with the email nonsense. They tried and failed to get to her with the phony scandals about the Clinton Foundation. They tried to scandalize her mother. And right now, in the darkest corners of Hell’s waiting room, these same Republican strategists are huddling and trying to figure out how to exploit the latest actions of her husband Anthony Weiner for political gain. So let them try. Let them be the ones to go there. Let them fail. I’m not even going to waste any time trying to think through the ways in which they’re most likely to come after her over this. Nor am I willing to put words to it. Trump can say and do what he wants about this. If he touches it, it’ll backfire on him anyway. Let him roll in the mud by himself on this one. The rest of us should just leave Huma alone and let her deal with what is clearly a private matter, however she needs to deal with it.